Getting away from it all and escaping the hustle and bustle of city life is great every once in awhile, but sometimes that doesn’t have to mean leaving the city itself. From whitewater falls to historic groves of ancient trees to sparkling lagoons, the city parks of America boast some pretty spectacular opportunities to escape. A great city park gives you the same sense of relaxation and rejuvenation that you get from driving out into the great outdoors, with a lot less hassle and time commitment. Looking for some prime examples of where you can experience this? Here’s our hand-picked list of 10 fantastic city parks. Tip: wear slip-resistant shoes for easy tree-climbing in Sacramento’s McKinley Park. Lisa Fernandez. From the colorful custom-designed playground, local artwork, and the recently renovated swan and duck pond, McKinley Park showcases the best of California’s capital city. What sets it apart from other urban parks, however, are the diversity of trees to be enjoyed in this 32.4-acre park. Ponderosa pines, English elms, coast live oaks, crepe myrtles, Modesto ashes, yellow poplars, Colorado blue spruces and fan palms all grow here, and that’s not even half of the varieties you can discover in this small unofficial arboretum. Sacramentans have been soaking up the shade here since the park was established in 1871. Encanto Park is an oasis in the Arizona desert. Located just a few blocks from the heart of Phoenix, Encanto Park is on the smaller side but packs a lot of options into its 222 acres. You can paddle the park’s lagoons, explore an amusement park, hike or run the nature trail, jump in the swimming pool, or play a few rounds of golf. Anglers also come to fish for rainbow trout, largemouth bass, tilapia, catfish and other species in the lagoons. With more than 80 miles of wooded trails (yes, you read that right), Forest Park lives up to its name. It’s located on the eastern slope of the Tualatin Mountains west of town and covers more than 5,100 acres overlooking the Willamette River. True to the Northwest’s nature and outdoor recreation-loving reputation, concerned citizens of Portland began their efforts to conserve this area as early as the 1860s. In addition to roaming the trails and taking in the views of Portland from across the river, you can also try to spot the 112 species of birds or 62 different mammals who live here. Home to the Phipps Conservatory and Botanical Gardens, which boasts some of the best gardens in the world, Schenley Park features 452 acres filled with wooded trails, a NCAA regulation track, soccer fields, tennis courts, a disc golf course and a regular golf course. If you like spending time outside, there is no shortage of things to do here. Sights and monuments to discover in this historic park include a log cabin that dates back to 1787 (or earlier), the Westinghouse Memorial that honors an engineer, and the stone footbridge over Panther Hollow Run. Grant Park’s 319 acres have been lovingly referred to as "Chicago’s Front Yard" and has been the site of several historic events over the years, including President Barack Obama’s 2008 Election Day victory speech. In addition to Grant Park’s outdoor recreation hotspots that include the gardens, tennis courts and baseball diamonds, it’s also the cultural hub of Chicago. The Art Institute, the Field Museum of Natural History, the Shedd Aquarium and the Adler Planetarium are all located here. One of the largest urban parks in North America at 4,310 acres, Griffith Park is known as the Central Park of the West Coast. It differs from its New York counterpart, however, in its rugged and wild nature and sheer scale—Griffith Park is a least five times bigger. After going for a hike and checking out the iconic Hollywood sign, beat the SoCal heat in the Griffith Observatory—a white, triple-domed building with science and space-themed displays inside. In the sprawl and traffic of Los Angeles, this refined architectural retreat and the unruly woods that surround it are a breath of fresh air. Part of the Brooklyn-Queens Greenway, Prospect Park was designed by the same architects as Central Park—Frederick Law Olmsted and Calvert Vaux—over a thirty-year period from 1865-1895. It features an intricately designed watercourse, a series of man-made waterfalls and pools, the majority of the remaining forest that once covered Brooklyn, and the country’s first ever Audubon Center. The popular Parade Ground was once set aside for military practice but is now one of the most active athletic fields in the city and is used for a variety of field sports. 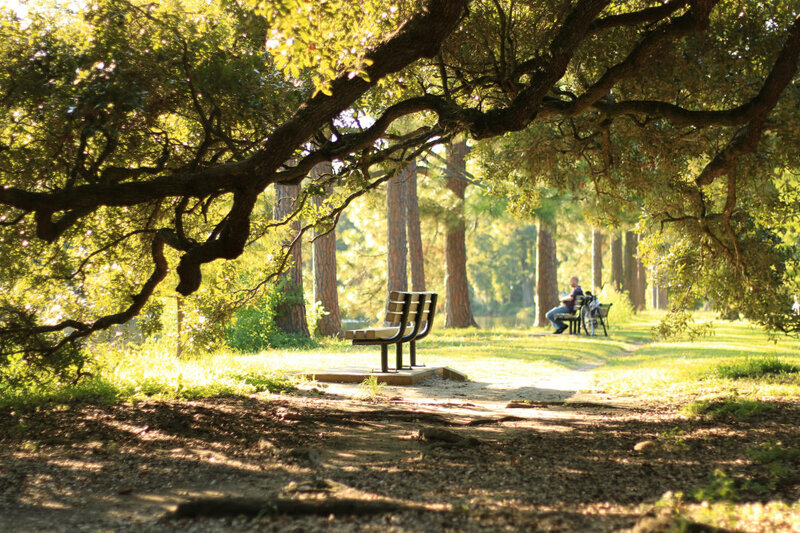 Originally a plantation during the days of early statehood, the land that is now Audubon Park was also used by both Confederate and Union armies during the Civil War and as a staging ground for the Buffalo Soldiers. The 360 acres were purchased by the city in 1871 and are located in the Uptown neighborhood of New Orleans. Stretch your legs with a walk or jog on the popular 1.7-mile ring road, which has been closed to cars since the 1980s. Stop by Ochsner Island, one of New Orleans’s premier birding destinations, on the east side of the park. It’s not often that an average park goer gets to take in an urban cityscape and a series of falls that drop a total of around 100 feet from the same viewing platform. In Sioux Falls, Falls Park incorporated the rugged and intense natural landscape into an easy-to-visit, scenic park. The Falls Park Visitor Information Center features a five-story viewing tower and deck to soak in the must-see sight of the falls. There’s also a biking and jogging trail that skirts along the waterfall’s edge if you want to see them up close. The 760-acre Point Defiance Park in Tacoma is located on a peninsula that protrudes out into the Puget Sound, with a stunning old growth forest—one of the few places in Tacoma that wasn’t clear cut in the heyday of the logging industry. Running or hiking on the intricate system of trails will make you feel like they are deep in the Olympic Peninsula rather than the industrial city of Tacoma. Other attractions in the park include a zoo, a marina that serves as a port for the Washington State Ferry System as well as private boaters, beaches, pagodas to rent for special events, and rose and rhododendron gardens.